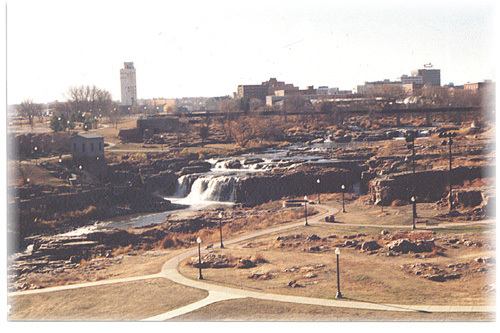 The Falls of the Big Sioux were carved in the hard Sioux Quartzite sedementary rock by the Big Sioux River near the end of the Wisconsin Ice age, 14,000 years ago. The sand that eventually became this quartzite was deposited around 1.6 billion years ago by a series of southeastward draining plexus of braided streams flowing into a shallow inland sea. The rock is pinkish, interlaced with deposits of claystone (Pipestone), and shale, most of which are shades of light to very dark pink. The red color comes from Iron Oxide. The Pipestone was quarried at three or more locations by pale-Indian to modern Indian tribes. Two of the more prominent locations being Pipstone National Monument in S.D. Minnesota, and the ancient quarry at Palisades State Park near Garretson, S.D. Silver was also mined for a short time at Palisades, while Uranium test holes were dug near Brandon, S.D. Silver deposits were found in these drillings. Paleo-placer gold deposits are a possibility in Quartize areas.